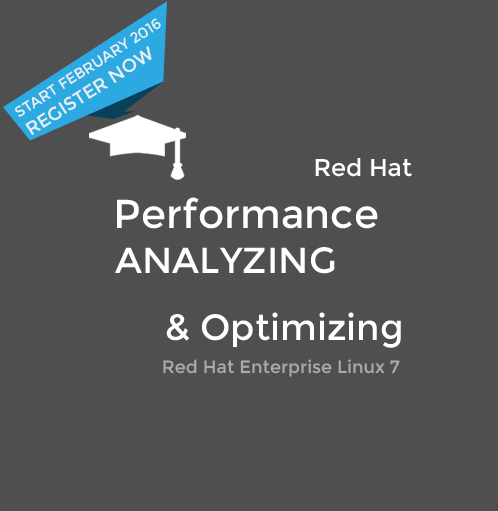 Understanding and analyzing Linux performance to determine best optimization methods. The parts of the operating system you need to optimize, and the mechanisms in place to do that. How to optimize Linux performance to manage servers with specific needs. A Linux professional who is preparing to take the exam for the Red Hat Certificate of Expertise in Performance Tuning (EX442). A person who wants to learn how to analyze and optimize performance of Linux. Lesson 1 “Performance Optimization Basics,” provides you with an understanding of how to align your business goals with the performance optimization goals of your organization. Lesson 2 This lesson will address tuning essentials. You’ll learn about different queueing techniques, as well as some of the basic elements that the Linux operating system contains to help you optimize performance. Lesson 3 “Limiting Resource Usage,” discusses different solutions that Linux includes to limit access to resources, including ulimit, cgroups, and how cgroups are integrated in systemd. Lesson 4 This lesson tackles the subject of benchmarking. Different benchmarking tools to gather data about your systems performance will be explained, and how to use awk to analyze and filter these data. It also demonstrates how to use plotting and performance co-pilot to present the data in a usable way. Lesson 5 Profiling is discussed in Lesson 5. Using profiling allows you to gather specific system information from specific parts of your computer. You’ll learn how to apply this on kernel, hardware, and storage. You’ll also learn how to use perf as a specific profiling solution. Lesson 6 Tracing is an approach that helps you gather detailed information about any part of the operating system. You’ll learn how to trace system calls, as well as library calls, and how to use systemtap for tracing specific parts of the operating system. Lesson 7 “Tuning for Small Files,” you’ll learn to understand the I/O workflow and the parts involved. Next, you’ll learn how to optimize parts that are essential for small file workloads, such as disk I/O and specific file system properties. Lesson 8 Tuning memory in Lesson 8 focuses on the optimization of memory. As memory is the vital part for the performance of your server, this might be the most important lesson in this course for you. You’ll learn about memory management, and about different solutions that exist for managing process management. You’ll also learn how swap plays a role in memory management, and how to handle specific situations related to memory leaks, OOM, and more. Lesson 9 “Tuning for CPU-intense Workloads,” involves understanding how the CPU works, and how to work with the different schedulers that are offered by the Linux kernel. It focuses on optimizing the schedulers for your workloads, and you’ll also learn how to apply generic techniques such as CPU pinning and interrupt balancing. Lesson 10 In “Tuning File Services,” you’ll learn how to optimize for file services. This involves managing typical file system features, such as journaling, fragmentation and aligning the file system with the disk geometry. We’ll also focus on network performance optimization, and you’ll learn how to optimize different components that play a role in communication between nodes over the network. Lesson 11 “Database Workload Tuning,” discusses how to optimize a server for database usage. This involves managing IPCs, huge pages, and memory over-commitment. Lesson 12 “Tuning Power Usage” explains how to optimize a Linux system for efficient power usage. You’ll learn about some generic power saving strategies, managing power states, and profiling power usage. You’ll also learn how to work with cpufreq. Lesson 13 “Tuning Virtualization,” covers the optimization of virtual machines. You’ll learn how to apply strategies such as CPU pinning, Kernel samepage merging, and cgroups. Lesson 14 Is a Sample Exam of the Red Hat EX442. The sample exam is made up of 16 questions. The answers are explained in detail in the sub-lessons.